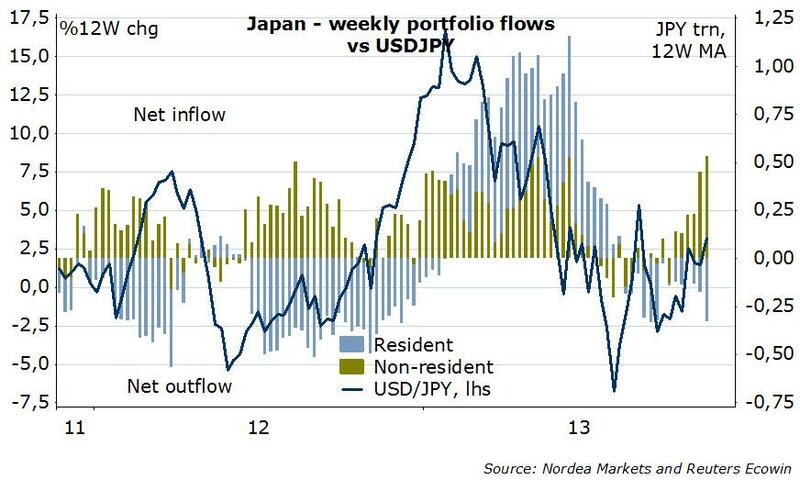 Home › 5) FX Theory › (8.1) Yen Weakness: Risk-Off Environment, Abenomics or Trade Deficit? The yen overshot during and after the financial crisis. The USD/JPY fell from 120 in 2008 to lowest levels of 74, by 62%, clearly into overvalued JPY territory, but recently it has risen to 102 again. What are the reasons? The weak performance of the Japanese currency is not explained only by the current risk-off environment or by Abenomics. For us, the Japanese oil trade deficit is paramount. Currently foreign investors drive the Nikkei higher, while some residents leave Japan. In total portfolio investments are rather inflows. The yen overshot during and after the financial crisis. The USD/JPY fell from 120 in 2008 to lowest levels of 74, by 62%. For the purchasing power parity, usually the producer price index is used. In terms of producer prices the yen should have appreciated by 22% = 197/160 between January 2007 and March 2013. The US producer price index rose from 160 to 197, American production is 22% more expensive. Thanks to deflation or low inflation, the Japanese price index, however, remained nearly unchanged. By March 2013, this tendency was reversed and the yen came back to “real mean reversion”: USD/JPY went from 120 in January 2007 to 96 in March 2013 and fell by exactly 25%. The Fed’s “unlimited” quantitative easing helped to increase house prices. Outflows of Foreign Direct Investments from China and other emerging markets sustained investments in US dollar. Verbal intervention by the Japanese officials additionally suppressed the currency claiming that they wanted to end Japanese deflation. With the upcoming higher VAT, currency depreciation, positive consumer and business climate, the CPI could effectively rise to 2%.